This is a reprint of Part 2, Chapter 19 of my book Helen Twelvetrees, Perfect Ingenue. It replaces a 2009 article that I found a bit lacking. My Woman is one of six Helen Twelvetrees movies playing on Turner Classic Movies, October 24, 2016—I'll send you a more complete reminder and preview of this mini-marathon on Saturday morning. Slated to star Nancy Carroll and Donald Cook under original title Goin’ to Town, but wound up one of two Columbia features (and a short) canceled when Hollywood technical workers went on strike. When work resumed, Carroll refused to return from a Honolulu vacation, so Columbia shifted Helen Twelvetrees and Victor Jory from the other canceled feature, Fury of the Jungle, to this one, now titled My Woman. Cook wound up appearing in Fury of the Jungle with Peggy Shannon recast in the role Columbia had originally signed Twelvetrees to play. For once, chaotic casting shifts worked in Helen’s favor. My Woman is one of her more enjoyable leading performances. My Woman opens with Helen’s character Connie doing a little shimmy and shake on the floor of her father’s Panama cafe. Her father, Pop Riley (Raymond Brown), and husband, Chick Rollins (Wallace Ford), lounge in hammocks outside while she performs. After completing her number, Connie joins them and tries to stir Chick into doing something with his life. The ex-vaudevillian had promised to take her to New York after they were married, but he explains they need money to get there and, besides, he’s already happy whiling away his days under the Panama sun. 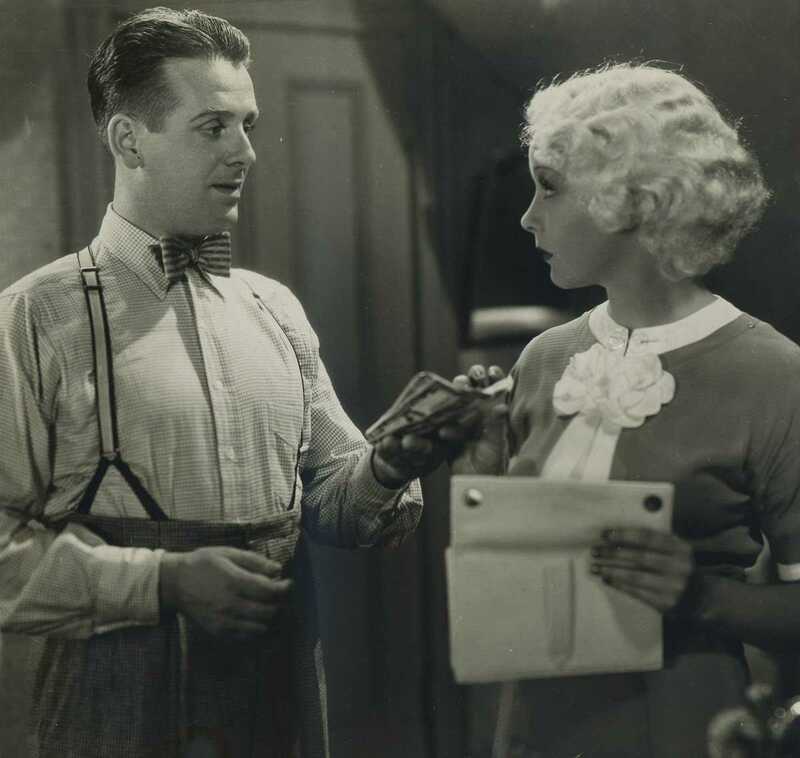 Above: Wallace Ford hands over the family savings to Helen near the start of My Woman. A ship’s purser, McCluskey (Ralph Freud), tells Connie that he’s surprised she settled for Chick because of all of the high-rolling tourists who pass through Pop’s cafe. Connie is happy with Chick, but her interest is piqued when McCluskey mentions that the president of radio’s American Broadcasting Company, John “JB” Bradley (Victor Jory), is there at the moment. Connie asks McCluskey to introduce her to Bradley as Miss Riley rather than Mrs. Rollins. Bradley is charmed by Connie and, with some prodding on Connie’s part, tells her to stop by the studio for an audition whenever she’s in New York City. After Bradley leaves, Connie tells Chick a little fib, claiming Bradley thought that he could become one of the biggest stars on the radio. This inflates Chick’s already swelled ego and manages to pull him off of his hammock and onto a ship bound for New York. Chick manages to gamble away more than half their savings by the time they reach New York, so Connie tries to meet with Bradley as soon as possible. Inside the studio Bradley’s underlings pass the buck, sending Connie from one office to the next, no one executive willing to take any chance beyond sending her to the next room in a seemingly endless chain. Finally, she sees a familiar, though unfriendly, face in Mr. Miller (Hobart Cavanaugh), Bradley’s secretary who was at his side in Panama. Miller is polite enough to take Connie’s phone number, but has no intention of letting her near the big boss, Bradley. After three or four weeks of the run-around, Connie finally manages to bump into Bradley outside of the building. He remembers her and scolds Miller for not allowing her to see him. Connie follows Bradley into his limousine after he invites her back to his place to discuss her future in radio over dinner and drinks. Bradley requests she sing the song he had heard her perform in Panama and is happy to hand over a card with his signature that will expedite any audition (I don’t know who dubs Helen’s voice during “I Knew I Couldn’t Hold You,” but it’s very likely not her, especially given her own past comments about her singing voice). Connie then turns glum. She returns Bradley’s card to him and explains how much easier her plan might have been had he not been so nice to her. He hadn’t even made a pass! But because he’s been so square she feels compelled to tell him the truth: she’s married and the audition is for her husband. Bradley is downcast for a moment, then decides, “No reason to be a bad sport.” He hands her back his card and wishes her luck before escorting her home late that night. When several auditions, including young Walter Brennan doing llama impressions, fail to impress producers and talent scouts at the station, Chick is given his shot. The production men at ABC radio think he could be a wise hire because JB’s girl—Connie, that is—brought him in. 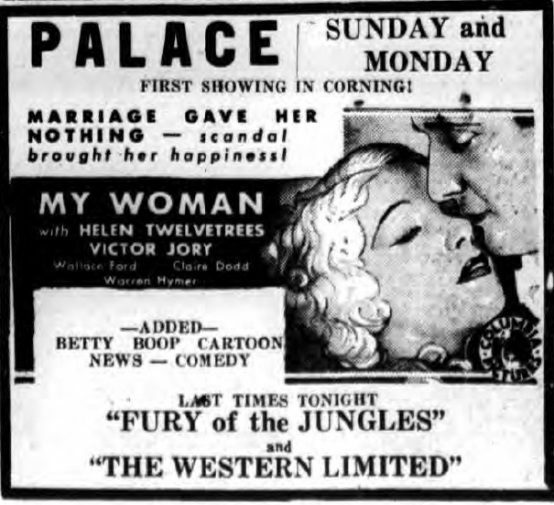 Above: Evening Leader ad for My Woman at the Corning (NY) Palace where it replaces Fury of the Jungle. November 25, 1933. Chick’s first assignment is reading stock quotes over the air, but he wants to do more. Connie convinces him that he ought to invent a character, suggesting he take advantage of his background to put together a series of sketches showing the life of a dumb vaudeville song and dance man. She writes the sketches for him and then returns to Bradley, begging him to give Chick a chance to make good. Bradley can’t resist her, so Chick has his opportunity. After Chick goes over big before a live audience, Bradley signs the couple to a joint contract that calls for Connie to write the material and Chick to perform it on the radio. The fan mail pours in and Chick becomes a huge star. Problem is, Chick’s always been a bit full of himself, and now he’s become impossible, a total egomaniac. He falls under the influence of a snooty society girl, Muriel Bennett (Claire Dodd), who encourages him to think of himself as a “creative artist.” Muriel delights in twisting Chick around her little finger and even convinces him to skip a broadcast to have dinner with her, explaining that it’s the only way the station will ever come to realize his true value. Chick grows distant from Connie as he spends more time with Muriel, and he begins drinking heavily as well. Chick is terrified one evening when Muriel’s maid informs them that Mrs. Rollins is at the door. Connie enters and tells Chick, “I was hoping I wouldn’t find you here.” She and Muriel trade snide comments, and then Connie tries to get Chick to see that Muriel is treating him like a sap: “You’re like a little pet monkey on a chain, can’t you see it?” When Chick refuses to leave with Connie, she congratulates Muriel, and tells her she can keep him for as long as she wants. “I never want to see him again,” Connie tells Bradley, who comes to see her after Chick tries to have her written out of their mutual contract. My Woman comes to a head when Chick arrives for work soused one afternoon, and instead of doing his show he opens with an impromptu announcement congratulating Connie and Bradley on their coming nuptials. Bradley storms into the sound room and fires Chick. Connie follows, seconds behind, hoping to head off any further trouble. The confrontation gives Chick the chance to reveal long-held suspicions about Connie and Bradley, dark jealousies he’s clung to since the night his wife returned home late at night with news of his audition. He tells Bradley he doesn’t care if he’s off the air as long as he’s getting paid. If the checks stop, then he’d have to sell the story about the bust-up of his marriage to the newspapers. Judging by a handful of reviews for My Woman, which were middling to good, the ending was changed sometime after the film first played. Originally, it was Chick who touches down in Panama, winning Connie back at the happy ending. Panama is far happier without Chick’s return as the movie now exists. It is nonetheless surprising that the heroine’s split with her husband is allowed to stand, and that Chick never faces any comeuppance beyond his loss of Connie. He simply continues on the same path he’s been headed, happy to ride off for a Honolulu vacation with Muriel, who, for some reason, has kept him around. 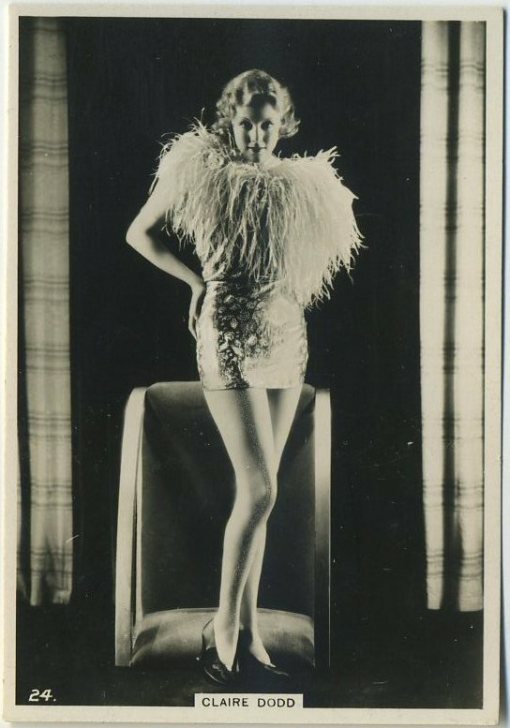 Helen’s is the biggest name in My Woman, and not only does she excel, so do supporting players Victor Jory and, especially, Wallace Ford, each in larger parts than usual. Helen finally gets a lead that never threatens her character with physical harm and while she loses her man, she wins a better one back in his place. The Wallace Ford role is, by far, the most interesting character in the film, a lout who becomes even more obnoxious as the movie wears on, without ever admitting his mistakes and never really being punished for his folly. Helen’s best scenes include her showdown with Claire Dodd while Ford is helpless and ignored by both women, and a bedroom scene with Ford, where she expresses jealousy over Dodd. The latter scene features the first seeds of trouble in Connie’s marriage to Chick, and Helen portrays it with just the right combination of disappointment and anger to keep us on her side. It’s a strong part for Helen, making it disappointing that Columbia did not choose to use her again at this time. Instead, Helen made the transition from star attraction to leading lady. 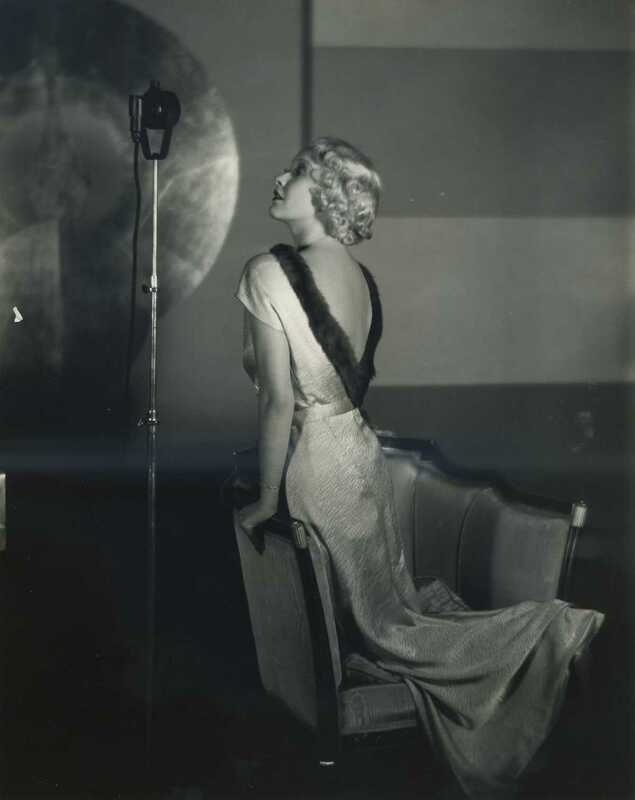 Above: Helen Twelvetrees in My Woman, Columbia promotional photo by Carl DeVoy. “Columbia Cancels All Players in 3 Pix Pending Strike Settlement.” Variety, July 18, 1933, 5. Nemo. “Hollywood Day by Day.” New Movie Magazine. November 1933, 8. “Review of My Woman.” Motion Picture Herald, October 21, 1933, 40. Wilk, Ralph. “A Little from Hollywood Lots.” Film Daily, August 8, 1933, 10. Wilk, Ralph. “A Little from Hollywood Lots.” Film Daily, September 16, 1933, 4. My Woman (1933). Columbia Pictures Corporation. Released October 5, 1933. 76 minutes. Directed by Victor Schertzinger. Starring Helen Twelvetrees, Victor Jory, Wallace Ford, Claire Dodd, Hobart Cavanaugh, Harry Holman, Charles Lane, Raymond Brown.